Writing, performing and recording music is all about capturing your unique sound. RADAR has been helping artists and engineers do exactly that since the dawn of digital recording in 1991. The secret? The unmistakable sound of RADAR’s A/D D/A converters. RADAR studio is the next level in removing the barriers to harnessing uninhibited sound. Musicians can now track, edit and mix in the box with popular DAWs, such as Pro Tools, enabling pure sound captioning in a rock solid environment. Don’t take our word for it. Listen to what the world’s top producers and engineers have to say. “RADAR STUDIO allows me to forget about the gear and focus on the music. I have all the headroom and sonic spectrum I could ever want! That’s why I take my RADAR with me everywhere.” — Chris “Frenchie” Smith, The Bubble, Austin Texas. Watch the video. Get the sound you’ve been waiting for at a price you won’t believe. You can always upgrade to 16 or 24 channels whenever you need more I/O. Otherwise you can record up to 90 Tracks of glorious sound with an 8-channel RADAR. Build yours now. *Offer does not include shipping. Expires at 12:00 AM, August 31st. iZ Technology Corporation is now located at Unit 200 – 1383 Coast Meridian Road in Port Coquitlam, British Columbia, Canada, V3C 6L1. All other contact details remain the same. Do you have a previous generation RADAR? Its rock solid performance and great sound will live on when you upgrade to RADAR studio. Find out how we can update you with the latest features and get you back to recording in no time. See who’s using iZ products, read product reviews, watch customer testimonials and much more right here. 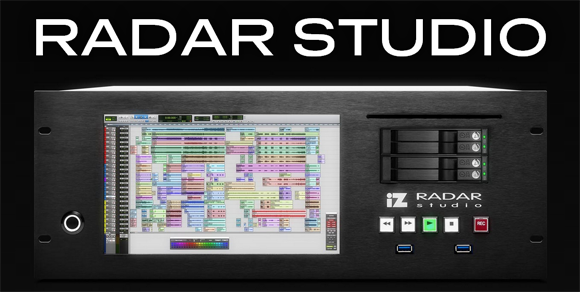 Forward this eNewsletter to a musician or engineer who has yet to hear about RADAR studio. Like iZ on Facebook and follow iZ on Twitter @iZcorp for updates on gear and where you can find RADAR studio near you.